Pienza, the Renaissance "ideal city"
We suggest to arrive at Fiumicino Airport, and we’ll shuttle you to our first hotel by the lake of Vico, the relaxing Relais Sans Souci. After a careful bike fitting we’ll be ready for our warm up ride along the peaceful river of the lake, a perfect start for the upcoming adventure. Dinner will be served at the gourmet restaurant of the hotel. We’ll start from the heart of Etruria in Vetralla, from here we head up towards Montefiascone, entering the Via Francigena, the pilgrimage trail connecting Canterbury to Rome created during medieval age. We’ll end in Orvieto, admiring its magnificent Cathedral, an absolute jewel of architecture in this umbrian town surrounded by peaceful hills and olive groves. We’ll discover the heart of Italy, pedalling the luscious hills of the green Umbria region. Today’s ride is absolutely peaceful, you’ll find yourself immersed in an almost meditative ride. One of the highlights of the whole tour is Città della Pieve, birthplace of “Il Perugino" (1450 approx. - 1523) one of the most important painters of the Italian Renaissance and teacher of Raffaello. We’ll stop in town to admire some of his most important works, seeing in its paintings the landscapes of our ride, with the views from Città della Pieve to the val di Chiana and lake Trasimeno. Then we’ll pass through Chiusi, a very important Etruscan town, ending the stage in Chianciano, perfect spot to relax at its delightful thermal baths. We’ll cross the Val di Chiana and enter the perfect scenery of Val d’Orcia, among neat vineyards and well groomed rolling hills. Beauty is everywhere, in the landscape and in the charming villages of Montepulciano, Pienza, San Quirico arriving at the famous Montalcino, right at the heart of one of the best wine growing area of the world. Our first stop for a coffee, or may be our first glass of the day is in Montepulciano with its “Vino Nobile”, in Pienza we must taste its tasty Pecorino, while in San Quirico we’ll stop to admire the quintessential Tuscan landscape of its countryside, a perfect combination of nature and man work. We’ll leave Montalcino crossing vineyards and olive groves along a fast downhill, stopping at the majestic Sant’Antimo Romanic abbey, marvelously immersed in the countryside. If we are lucky we could listen to the monks’ Gregorian chant, a very unique experience. 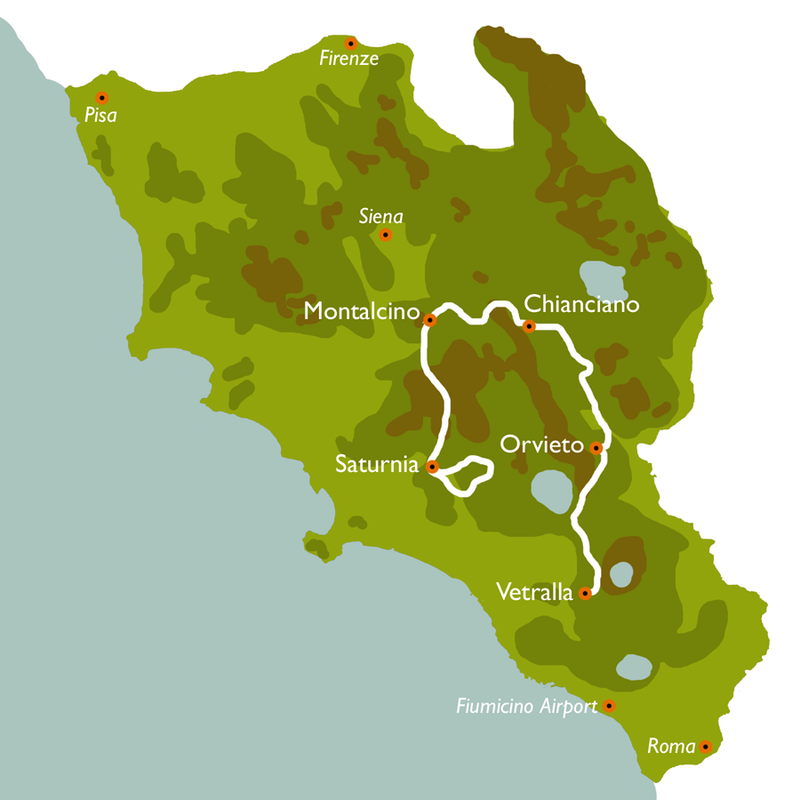 Then we’ll coast the western slopes of massive Monte Amiata, the highest range of southern Tuscany standing up all over the landscape. Our ride ends in Saturnia, probably Italy’s most scenic thermal baths with its “Cascate del Mulino” natural hot spring water falls. Today’s ride is quite rolling, with the scenery along the climb to the towns of Pitigliano and Sovana looking taken out of a fairytale. Those medieval towns along with the village of Sorano create the archaeological park of Tufa towns. Pitigliano is perched on a cliff, entirely built in local Tufa stone, known as the “Small Jerusalem” having had one of biggest jewish district of Italy. Sovana is famous for its many mysterious etruscan canyons and the majestic necropolis, like the Hildebrand tomb. Well, it’s time to say goodbye, but we are sure this part of Italy will touch your hearts and you’ll come again to visit more. The price of this Tour starts from 2.750 €, and it's fully customizable.